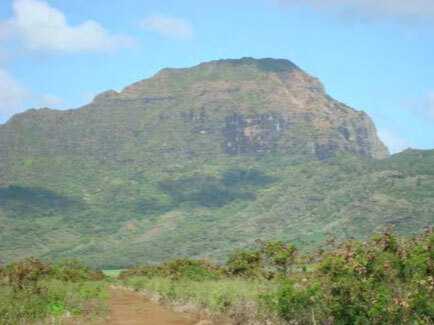 Keolewa Heiau (the shifting sand) is situated along the Hā‘upu ridge line on the peak of Hā‘upu. According to chants, Keolewa can only be seen as a bird in the sky (above the clouds). The small heiau atop Mt. Hā‘upu is dedicated to Laka, the goddess of hula, whose kinolau (embodied form) lives in the wild and sacred plants of the upland forest that are used by hula practitioners. Hā‘upu Ridge is revered as a dividing line between and meeting place where the powerful fire‐goddess Pele made passionate love with the demi‐god Kamapua‘a. The Kōloa region south of the ridge was controlled by Pele; its dry and rocky landscape reflects her harsh, impatient and dominant personality. The lusher Līhu‘e side of the ridge was home to the pig god Kamapua‘a, who is associated with “taro, fertility and the creation of fertile springs necessary to sustain life,” and who is known to excel as a lover. According to tradition, “Pele and Kamapua‘a are believed to have been involved in a tumultuous love affair with each other in the vicinity of Hā‘upu and the topography of the area is believed to have been shaped by the fury of their love‐making. In times of drought, the fertile and lush domain of Kamapua‘a is said to be inhabited by Pele, whereas in times of heavy rains the dry and arid domain of Pele is said to be inhabited by Kamapua‘a. It is at these times that their love affairs are believed to continue.